More than 450 people with mental or physical handicaps visited the University of Miami on Saturday for a space-themed FunDay, the longest standing service day at UM, partnering students with people with special needs. In its 32nd year, FunDay featured carnival-style games, food, a petting zoo, craft tables and dance performances for visitors and UM students to enjoy. The event began at 9:30 a.m. with the Hurricane cheerleaders onstage wearing pink bows and shaking pompoms in honor of Valentine’s Day. Patricia Whitely, vice president for student affairs, welcomed the participants next to her own “buddy” for the day, a young girl named Lexi. Volunteers and visitors dispersed throughout the Rock and the green in front of Richter Library to start the “fun” of FunDay. One table along the way was the music therapy booth, where instruments like ukuleles, maracas and tambourines were ready to be used. Music therapy is a form of counseling used to help individuals communicate and meet physical, emotional, cognitive and social needs. Genevieve Scott, a guitar player, singer and music therapy major, danced around in the center of a semicircle and led participants in songs such as Frank Sinatra’s “Fly Me To The Moon.” According to Scott, the music therapy group is a long-standing tradition at FunDay. In a slightly more wild section of the green, llamas cohabited with baby ducks and two squealing pigs. The petting zoo was a favorite among guests, who could go inside and feed the animals. Scott Dorfman, a person with a disability from Wayside Baptist Church in Miami, watched the animals with his two partners for the day, junior Mira Kawash and senior Hyelim Chang. Although Kawash and Chang were participating in the event for the first time, Dorfman said he could not even remember how many times he had been to FunDay. Dorfman took a moment in front of the petting zoo to tell his companions about his girlfriend. For Chang, a psychology major, spending the day with a buddy dispelled misconceptions about people with special needs. Freshman Coleman Cummins, a philosophy major and brother of the Lambda Chi Alpha fraternity, interacted with FunDay attendees while he worked serving cookies. His favorite part was putting smiles on people’s faces with the sweet treats. In a more physically-demanding job, brothers of the Sigma Alpha Epsilon fraternity took to the dunk tank for an annual tradition. Sophomore Connor Quinn was repeatedly dunked on an unusually chilly day in South Florida. “It’s cold right now, but it’s warmer than when I have to climb out,” Quinn said. Off to the side, another brother, Austin Miller, was in charge of drying the softballs and encouraging participants. 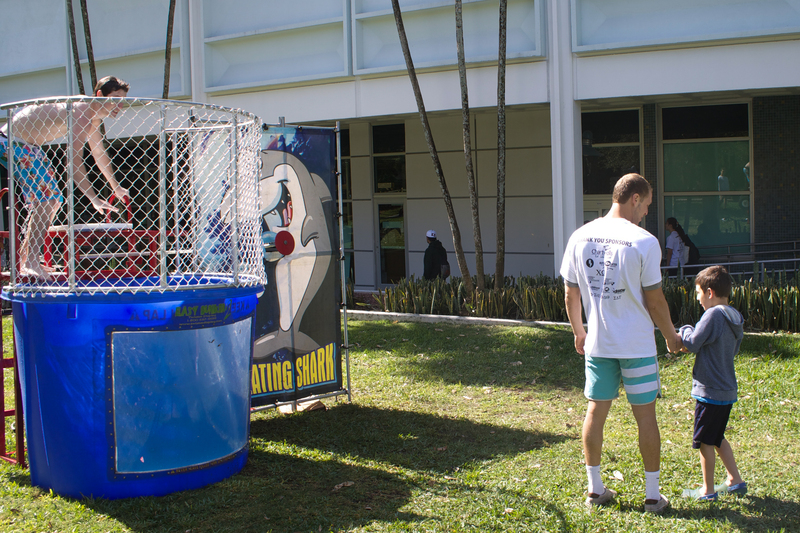 Miller said that SAE’s participation in the dunk tank and FunDay as a whole was simply returning a favor. “At the University of Miami, the community does so much for us, so we are just giving back,” said Miller, a junior studying finance and real estate. FunDay created an exciting event for the disabled community and something to remember it by with coloring stations, a photo booth inside the UC Lounge and even photo opportunities with Sebastian the Ibis, who was walking around giving hugs and dancing to songs such as “Happy” by Pharrell Williams. According to Maddox, people with disabilities share the same basic needs as everyone else. UCP of South Florida is more than 50 years old and one of the largest health care organizations in South Florida, according to ucpsouthflorida.org. The organization specializes in caring for people with cerebral palsy as well as those with other developmental disabilities or special needs to help them reach their fullest potential. “Just making sure they have fun while living with whatever disability they have … making sure they’re happy,” Maddox said. According to Maddox, a friendly word of encouragement or a hug on a bad day is something anyone could use to feel better. She said working at UCP with special citizens has helped her live a fuller life, too.